Samira Jassam, 51, was arrested by Iraqi police and confessed to recruiting the women and orchestrating dozens of attacks. In a video confession, she explained how she had mentally prepared the women for martyrdom operations, passed them on to terrorists who provided explosives, and then took the bombers to their targets. “We arrested Samira Jassim, known as ‘Um al-Mumenin’, the mother of the believers, who was responsible for recruiting 80 women”, Major General Qassim Atta said. “She confessed her responsibility for these actions, and she confirmed that 28 attempts had been made in one of the terrorists’ strongholds,” he said. Samira Jassim was arrested on January 21. She is allegedly linked to the Ansar al-Sunnah insurgent group. Two of the attacks for which Samira Jassim admitted responsibility in the video confession took place in Diyala province, in central Iraq, which is considered one of the most dangerous areas of the country. The Associated Press reports US military figures indicate at least 36 female suicide bombers attempted or carried out 32 attacks last year. Women are often allowed through military checkpoints without being searched, making it easier for them to hide explosives under their traditional robes. For once in my life I am speechless in regard to these abhorrent acts. “Of the 24 children, five had a mental disability. From analysing the others’ remains, we established that they were homeless,” said Jasim. American soldiers stationed in Iraq have reported that the insurgency has armed children as young as 11 to fight against them. Al-Qaeda is targeting orphans, street children and mentally disabled children as suicide bomber recruits as well as women, according to the Iraqi Interior Ministry. There have been at least 16 suicide attacks carried out by women in recent months in the volatile Al-Qaeda stronghold of Diyala province, north of the Iraqi capital, Baghdad. 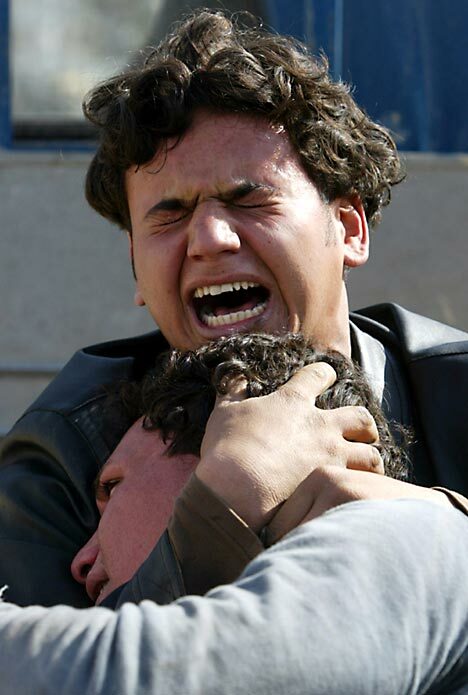 Iraqi children in general make up 20 percent of the civilian victims of bomb attacks in the country. Al Qaeda in Iraq conducted two successful strikes in Baghdad and the northern city of Kirkuk. 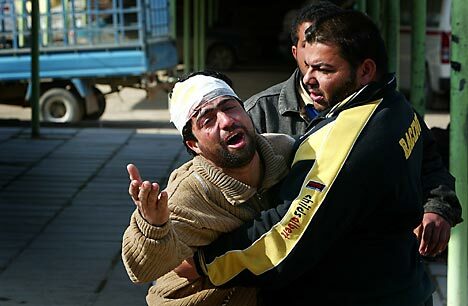 At least seventy Iraqi civilians were killed and more than 300 wounded in four suicide attacks, CNN reported. The attacks were carried out by female terrorists. 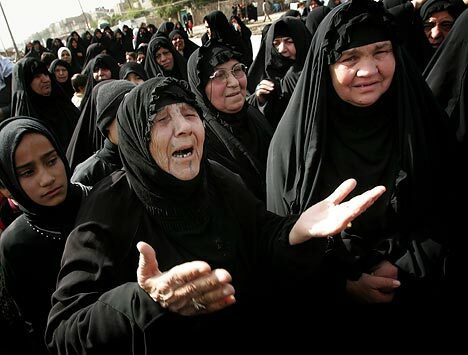 The attacks in Baghdad occurred in three separate locations as the female bombers targeted Shia pilgrims traveling on foot to a shrine in the Kadhamiyah district. The three bombers waded into the crowds and detonated their suicide vests within thirty minutes of each other. Thirty-two Iraqis were reported killed and 102 were wounded. In Kirkuk, a female suicide bomber detonated her vest in the middle of a crowd of more than 5,000 Kurds who gathered to protest the delay of provincial elections in Kirkuk. Just after the detonation, gunmen opened up on the crowd. 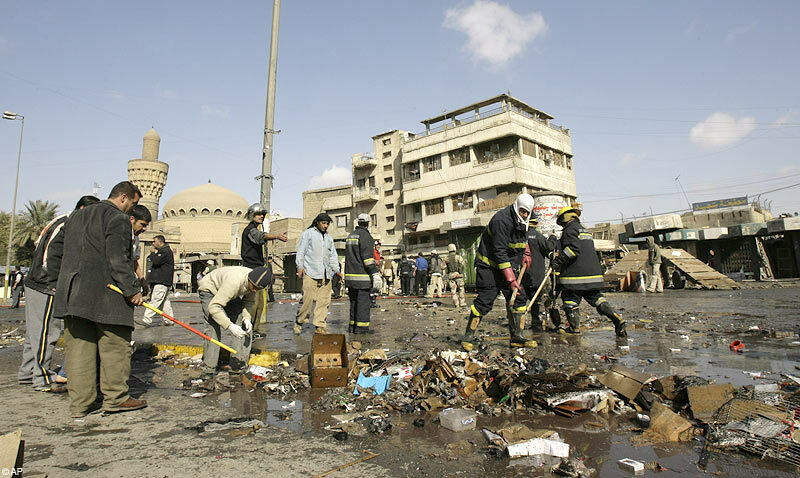 Thirty-eight Iraqis were killed and 178 were wounded in the deadly attack. Five more were wounded after a clash broke out between “unknown gunmen” and security forces outside the headquarters of the Turkmen Party. A curfew was immediately imposed on the province. Kirkuk remains a flashpoint for violence as Kurds, Arabs, and Turkmen vie for political power in the northern city. The Kurds seek to bring the oil-rich city into the political sphere of the Kurdistan Regional Government while Kurds have retaken lands from Arabs settled in the region during the rule of Saddam Hussein. Last week, the Iraqi Parliament passed a law delaying provincial elections and setting up a power-sharing agreement between the parties. The Kurdish political parties walked out of Parliament in protest. Today’s attacks demonstrate that while al Qaeda has suffered major setbacks in Iraq, the network still maintains the capacity to conduct high-profile, mass-casualty suicide strikes. The last major attack occurred on July 24, when a female suicide bomber killed eight Awakening fighters and wounded 15 during an attack in Baqubah. Al Qaeda suicide bombers also struck in Diyala province on July 15. Two suicide bombers detonated their vests within the Saad military camp as Iraqi Army recruits gathered. Twenty-two recruits were killed and more than 55 wounded. The last major bombing in Baghdad occurred on June 18, when a car bomb detonated in the Shia neighborhood of Hayy Hurriyah in Baghdad’s Kadhamiyah district. The US military determined the attack was carried out by cell run by a Mahdi Army leader named Haydar Mahdi Khadum Al Fawadi. The US and Iraqi military have heavily targeted al Qaeda networks in the central and northern provinces over the past two days. Eighty-eight al Qaeda operatives were captured and four were killed during operations. Today, Coalition special forces captured 30 suspected al Qaeda fighters during raids in Abu Ghraib and Mosul. An al Qaeda cell leader and a bomb maker were captured in Abu Ghraib and a financier for Ninewa province was captured in Mosul. Also, Coalition forces surrounded “a hideout for AQI facilitators and smugglers coming in from Syria” in a village southwest of Mosul, and captured 15 terrorists. Yesterday, US and Iraqi forces killed four al Qaeda fighters and detained 58 suspects during search operation in Ninewa province. Four Iraqi soldiers were killed during gun battle. Iraqi and US forces are massing for a major offensive in Diyala province, where al Qaeda still maintains sanctuaries in the rural regions. The operation is expected to begin in early August. Al Qaeda fanatics plumbed to sickening new depths yesterday when they turned two women with Down’s syndrome into human bombs to kill 99 people in Baghdad.The unwitting pawns were apparently fooled into wearing explosive vests which were then detonated remotely by mobile phones as the women mingled with crowds. 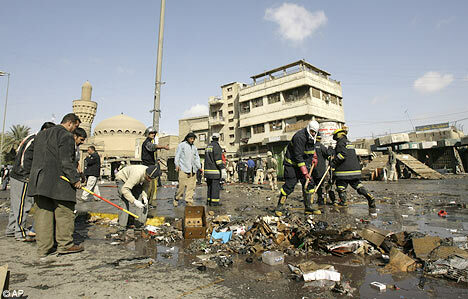 The two blasts caused carnage at two busy markets in the Iraqi capital’s deadliest atrocity since last spring. A U.S. military spokesman conveyed the sense of outrage over the depravity of the masterminds. “They have shown their true demonic character,” said Lieutenant-Colonel Steve Stover. Involving women in fighting violates religious taboos in Iraq, but extremists are recruiting females and youths to stage suicide attacks in a desperate attempt to beat tightened security measures. Women can avoid thorough searches at checkpoints because of Islamic sensitivities, and four have carried out suicide bombings since November. Yesterday’s attacks are the first ever to have involved anyone with Down’s Syndrome. The first attack was in the central al-Ghazl market, where numerous birds and animals were on sale. 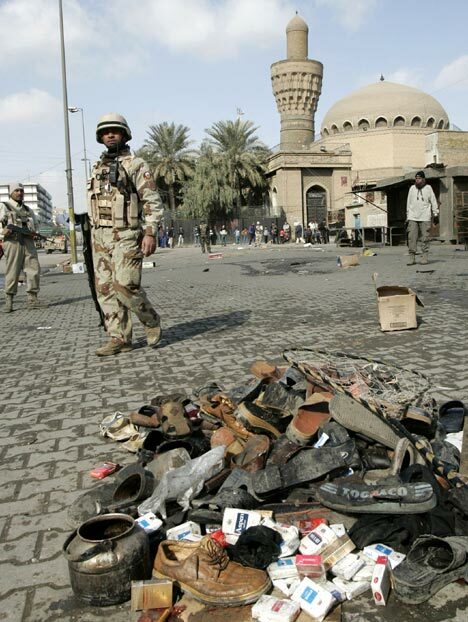 The weekly bazaar had been bombed several times but recently had re-emerged as a popular place to shop and stroll as Baghdad security improved and a Friday ban on driving was lifted. The woman carrying the bomb, hidden under her traditional black Islamic robe, was a familiar figure at the market where she sold cream. At least 46 people were killed and more than 100 wounded. Fire crews scooped up remains scattered among blood, clothing and pigeon carcasses. About 20 minutes later, the second bomb blew up a bird market in a predominantly Shiite area in southeastern Baghdad, killing up to 22 people and wounding 65, according to police and hospital officials. The women used in the attacks were unlikely to have been willing participants, said the chief Iraqi military spokesman in Baghdad, Brigadier-General Qassim al-Moussawi. The attacks, shortly before the weekly Islamic call to prayer, were the latest in a series of violent incidents that have been chipping away at Iraqi confidence in the permanence of recent security improvements. One pigeon seller at the al-Ghazl market said it had been particularly busy because it was a pleasantly crisp and clear winter day after a recent cold spell. “I have been going to the pet market with my friend every Friday, selling and buying pigeons,” said Ali Ahmed, who was hit by shrapnel in his legs and chest. Many teenage boys were among the casualties. A survivor of the other blast, Rae Muhsin, the 21-year-old owner of a mobile phone store, said he was walking towards the New Baghdad bird market when the bomb went off, shattering the windows of nearby stores. The number of Iraqi civilians and security forces killed in January was 599, according to the Associated Press news agency, the lowest monthly death toll since December 2005, and continuing a downward trend since the autumn. U.S. forces, meanwhile, have expanded offensives in central and northern Iraq with their “surge force” of 30,000 troops.